Of all flora, flowers may just be the poets. Whenever they are present, flowers will uplift the spirit and romanticize any garden, pot, or occasion. What’s more, flowers enlighten not just through their beautiful appearance, but also through the wonders of what they represent. 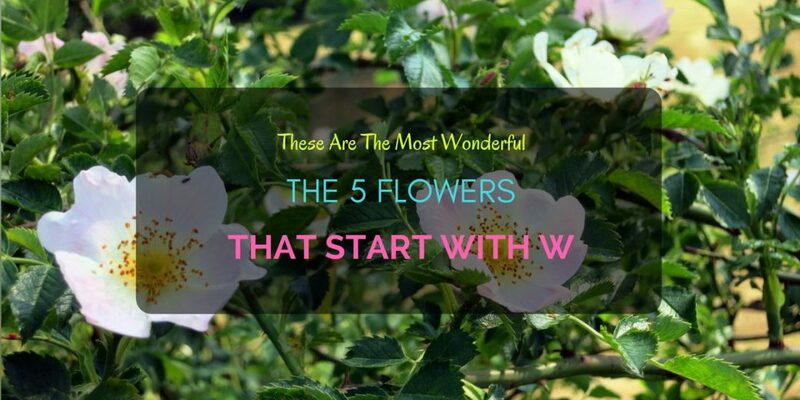 These five flowers that start with W are indeed full of exactly that. What is it about these modified shoots of arranged stamens and carpels that they have succeeded in entrancing the entire world? Indeed, love and appreciation for nature’s blooms go way beyond borders, cultures, countries, or race to the point of gaining religious, cultural, ornamental, culinary, and even medicinal value. Clearly, a rose is more than just a rose; and a wallflower is more than justa blossom. It’s what they represent, what they convey, and what they mean to the people that appreciate them. A plant to cherish due to its short lifespan, the Wallflower is a timeless beauty as it blooms month after month after month. The bright and fragrant orange-yellow flowers are a refreshing sight. Also, the wallflower is ideal for beginners as they are hardy and easy to maintain. So, though wallflowers are short-lived, growing them will be well worth your time. Wallflowers represent mortality and life itself, including the beauty of impermanence. Wattles, the short-lived yet fast growing plant is the national flower of Australia and rightly so as the plant covers most of the continent and has continued to spread in the last 35 million years. Besides finding wattles almost everywhere “down under,” they are also widespread in Australian culture, including acoat of arms, national colors, national and sporting events and much more. It’s always exciting when the botanical or scientific name of a flowering plant contains the word odorata or odoratum, the former being the formal name of the Woodruff. It’s exciting because this most surely means its blooms will emit the sweetest fragrances. However, what’s particularly interesting about the woodruff is that its smell becomes more potent when the flower has dried. The Woodruffrepresents the power of a refreshing scent to invigorate. The fragrant Wisteria’s cascading blooms of blues and purples are perfect for garden and pergola draperies. However, establishing the wisteria may take years, so, you will need some patience. Don’t worry; they will be worth the wait. The sweet smelling wisteria flower represents good fortune and new stirrings of love. Here it is, the great grandfather of the roses we know today. The Rosa Acocularis, or the wild rose, has been flourishing for the last 70 million years. That’s right! When the dinosaurs still roamed the earth, the wild rose was already spreading. Although the old wild rose does not have the same elaborate trappings as its modern kin, its sweet fragrance, and pure beauty reminds you that it doesn’t take much to be wonderful. The wild rose symbolizes elegance in simplicity. The Wild Rose Flower Was The Ancestor Of All The Roses We See Today.